Why Do Half of Millennials Still Live With Mommy and Daddy? Here is a shocking stat I came across recently: 48 percent of all 25-year-old Americans are living at home with their mommy and daddy (ZeroHedge). If you happen to be one of them, I’m here to tell you that you don’t have a debt problem, nor do you have a spending problem. What you have is an income problem. The dream of living in a loft as Joey-and-Chandler from Friends is quickly turning into an army of millennials living in their parents’ basements. 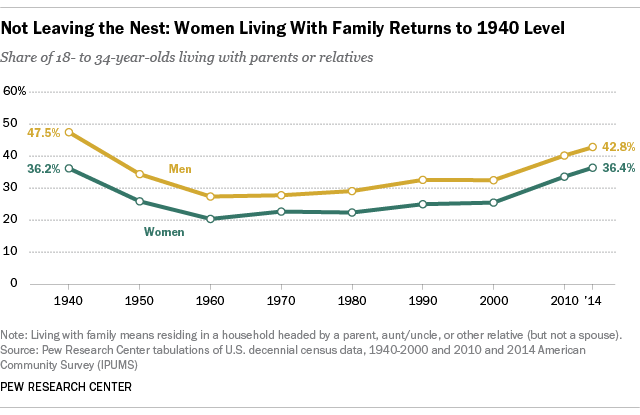 A Pew report shows that while massive numbers of young men are in their parents basements, young women are actually living with their parents more now than at any time since 1940! My guess is that more and more women graduating college with the massive debt that comes with that is contributing to this. Many twenty-somethings are eager to get out of debt, but not all debt is bad. I go into debt if it will produce income for me. 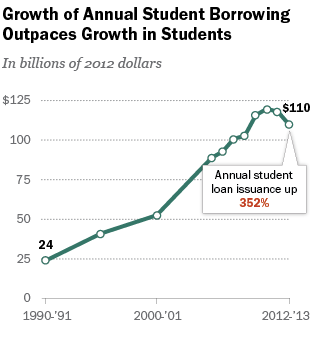 The problem is most Millennials are in bad debt—student loans and such. There is a simple fix to get out of debt except to increase income. Income solves all. 1) Make a conscious decision to increase income. 2) Promote and sell yourself (in that order). I advise not listening to people who say that your first priority should be on paying off debt. Stacking more paper should be the only priority. Once income rises you’ll be able to pay off debts much faster and easier. I was once doing a real estate deal and liked the service the young agent was providing. He was 28, and not making enough dough. I offered him the opportunity to go work for me where he would make three times his $25,000 salary helping me do my real estate transactions. The guy didn’t want to move and follow the money. Young people are graduating college more than any other generation. They are in greater debt after college and they can’t get work. Why? They don’t follow the money. 2. Be willing to get uncomfortable. 3. Do the difficult things. 4. Cut out the negative influences. 5. See opportunities and act. Millennials are the most educated generation who have the most debt and the most trouble finding jobs. I suggest millennials throw out their resumes because they only end up in a black hole and no one cares about resumes. One should approach searching for a job like looking to sell to prospects. In a job hunt, you are selling who you are and what you can do for a company. Job hunters should seek out people who they want to work for, seek them out and find a way to get in front of them. You need to follow money and opportunity, don’t be held back by old ways of thinking. It is vital to your success to break out and seize opportunities available to you in today’s world. If you are a Millennial in debt, think about relocating in order to increase your income if you’re struggling in your hometown with jobs that won’t pay you anything. experience is key to succeed in real-estate investing. Make a list of people, not companies, but people that you want to work for and then research how to get to them. You must do whatever it takes to make that connection. Create wealth for yourself. If you are forced to return back to your parents, you will continue to suffer if you do not take massive action to achieve financial freedom. ...and every young person should have a clear purpose and goal before taking on such enormous debt. I created Cardone University as a much cheaper alternative to the Yales and Harvards that will give the tools millennials need to succeed today in 2016, with over 1500 videos on demand.